The refugio and hotel infrastructure in Torres Del Paine make this landmark accessible through a variety of experience and exertion. Visitors can simply bus into the Lago Grey Hotel to view an astonishing scene of dark jagged mountains, bright green trees, and turquoise blue glacier lakes from the lounge. They can take a boat to see Glacier Grey or the Catamaran to Paine Grande where they can do day hikes. Visitors can hut-to-hut hike with a light pack between refugios or they can carry all their belongings and backcountry camp. Torres Del Paine is a true multi-purpose park. On the trail we saw people from their 20s to their 70s, a very balanced gender distribution, two person partners, solo hikers and guided groups. On my W Trek I spent two nights at refugio campgrounds, one at a primitive free campground one and ended the trip with two nights in a refugio. 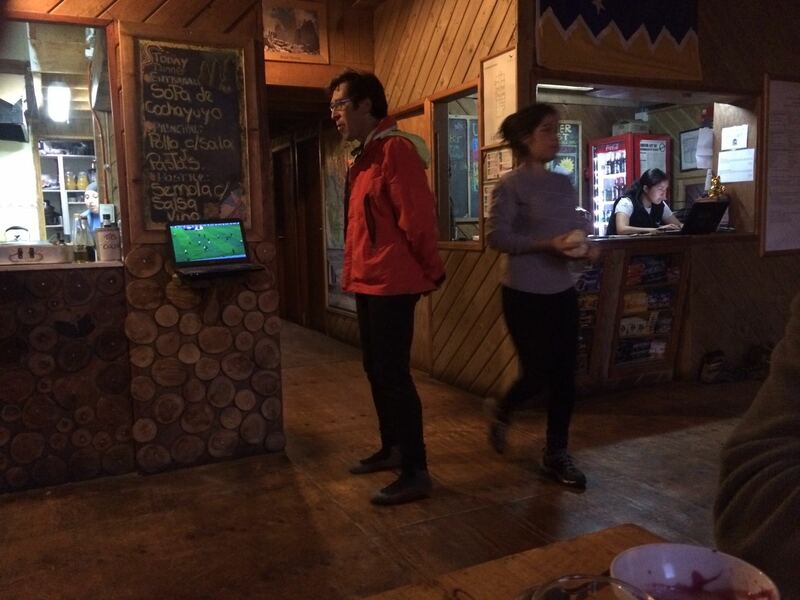 I also experienced several meals inside the cooking huts and the refugio dinning halls. The goal of this post is to describe the refugio experiences on the W trek so you too know what to expect. A refguio site typically consists of the following: a camping area, a cooking hut, a kiosk where you can buy snacks (often in the cooking hut), bathrooms that flush (no TP down the toilet though), showers (no hot water guarantee), a lodge with accommodation for sleeping, and a dinning area in the lodge for breakfast/dinner where you can also purchase drinks. Most even offer the option to purchase a quantity of Wifi! Cash is accepted and all the places seem to accept credit card. 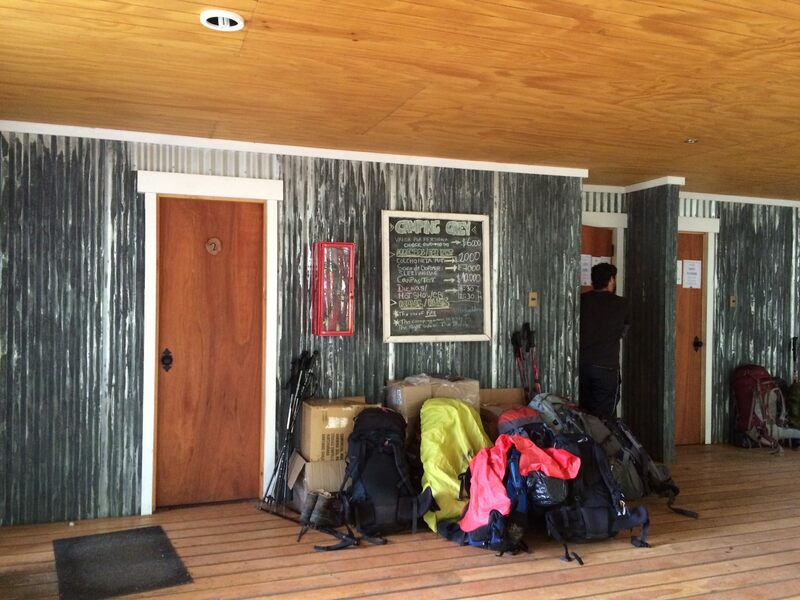 There is typically separate check-in areas for campers and hut-hikers, however these are not always staffed so you may end up going to the main lodge anyways. These lodges serve an expensive breakfast, boxed lunches and dinner. For dinner, you must purchase a dinner ticket by 3-5pm of the same day to get food because the staff only make enough food as they have tickets. If you know that you’ll want some dinners on your trek I’d recommend just booking those meals with your accommodation to avoid potentially going hungry that night if you arrive late. A refugio dinner is a plated meal starting with bread and soup, followed by entree and then desert. Entrees are typically a chicken-based meal with some sauce and either rice or potatoes. In high season you are typically given a seating time for dinner (ex: 7, 8, 9pm). Shortly after you have finished desert you are asked to clear out for the next group. Refugio staff all have two-way radios but they communicate between locations using instant message services via the internet. I think this makes it easy for them to multi-task between communicating with each other and the long lines of people at reception, but it is really inefficient and a lot of waiting around for you. 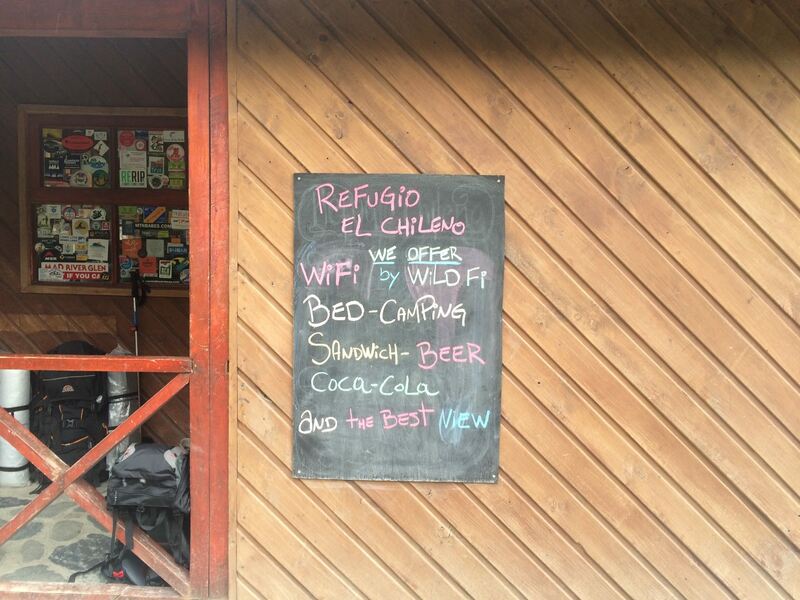 The one benefit is there is potential to do things like change the refugio you are sleeping the coming night, order dinner for the next refugio you are going to, book a boat seat, etc. by communicating between refugios this way. Surprisingly, not all this infrastructure is built on publicly protected land. Half of the park of Torres Del Paine is protected under Chile’s National Forestry Corporation (CONAF) and the other part owned privately by Fantastico Sur. The Fantastico Sur region of the park extends from the Valle del Francis to the Base de Las Torres parts of the trail. All refugios in this area are owned and operated by Fantastico Sur. In the CONAF areas, the refugios are operated by Vertice Patagonia. This means depending on where you want to stay you’ll have to book with a specific company. In general I found the Vertice refugios much larger and hotel-like, more reasonably priced and containing more amenities than the Fantastico Sur properties which more resemble lodges. Refugio Grey for example even had the option of getting a massage. While there are many similarities to the Refugio operations, there are also many irregularities. Even among refugios operated by the same company (Ex: Fantastico Sur). The hours the cook huts are “closed” are different, some refugios lock the cook huts while they are closed while others don’t. Some require you to take your boots off inside or leave backpacks outside while others don’t care either way. Similarly accommodations can differ with some refugios offering domes, cabins, rooms or bunk beds. In Francis for example you have to cook in the bathrooms instead of them providing a hut. Patagonia has a deep connection with backpackers and climbers however, its rawness has been tamed. Torres Del Paine still has all the beauty of Alaska, but it now has the convenience of Yosemite through the refugio network. This accessibility and the ample amenities to visitors has also likely lead to much of the park’s popularity. Given all this convenience you may expect that you’ll be able to purchase any extra gear you may need if a situation arrises however, the convenience has not been developed around the backcountry experience. At these refugios you’ll find it much easier to purchase several boxes of wine than a camping stake or gas for your stove. More and more at these refugios they are working on segregating these two very different visitors: hut-hikers and backcountry campers. The segregation is physical. Backcountry campers stay outside and cook in the hut. 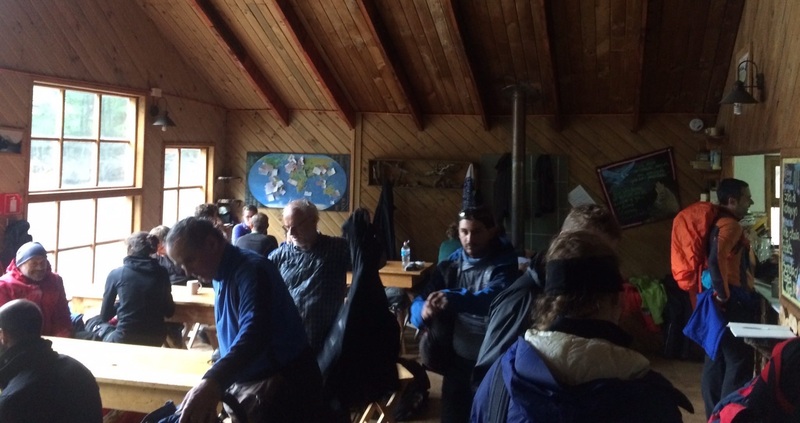 Hut hikers stay inside and eat in the dinning hall. At a number of locations campers and hut-hikers also have different bathrooms. However, the division is also cultural. I found campers typically to be on a journey of 4-15 weeks of travel, they have the essentialist backcountry camper mindset and the limited space of the cooking hut encourages interactions among strangers. Conversely hut hikers typically have only a couple weeks of travel and are more common to keep to their existing group of companions than meet strangers at dinner. I applaud the accessibility of the park but I found transactional tourist commercialism creeping into the park compared to the experience driven nature of backcountry camping. This appears in many forms: A sign prompting visitors to weigh their pack accompanying a list of times when horses can transport your luggage. The distribution of garlic cloves, foreign to this ecosystem, along the Lago Norderskjold trail likely as a natural bug repellant. The prioritization of stocking alcohol over camping gear. People partying into the night with the volume of a football match while others camp in the UNESCO recognized wilderness site. 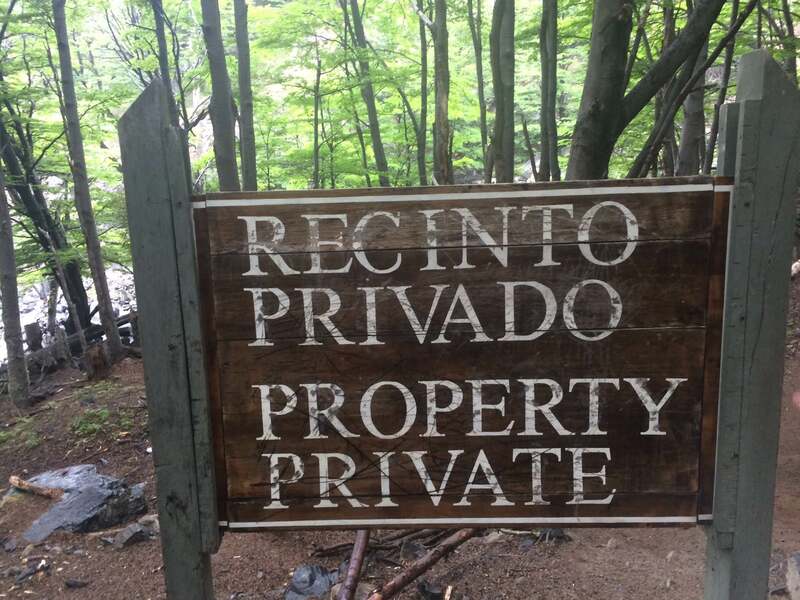 Wilderness cannot exist alongside luxury and I’m afraid Torres Del Paine is going to increasingly build accommodation for hut-hikers over backcountry campers. Diluting this wilderness experience and increasing the commercialism of the experience. All that being said, I really enjoyed my trek on the W. I enjoyed being able to have a simple luxury of a hot meal after a long cold wet day and sleep in a bed after spending four near-constent days in wet. The refugios were an interesting experience. However, if I visited Torres Del Paine again I’d likely visit only the off the beaten path places, try to stick to non-refugio campgrounds and keep off the W circuit as much as possible to increase the backcountry experience I sought in a once wild Patagonia.